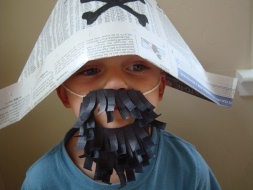 This Homemade Beard is a great addition to any Pirate costume! Our template comes in two sizes, and you can make this out of paper or felt! 1. Cut out the beard template, trace it onto a piece of beard colored paper, and cut it out. Cut out a few strips of the same colored paper. We made our strips about ¼" wide. 2. Cut a piece of string long enough to fit around the child's head. Glue the center of the string onto the beard. 3. Cut your strips into 1-1½" lengths. Wrap each strip around a pencil to curl it (this is technically called "quilling"). 4. On the front of the beard (the string is at the back) begin gluing your "hair" all over the beard. Hint: It's easier if you start at the bottom and work to the top of the beard. You're done your Homemade Beard!